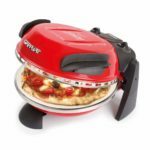 Available in red or black, this G3 Ferrari indoor pizza maker is well ahead of its rivals. One of its biggest selling points is the fact that it can reach up to 390°C, unlike a lot of other indoor ovens. This is seen as an ideal temperature for pizza making, as it results in a crispy base and even cooking in a short time. The thermostat helps you select one of the three temperature settings, ranging from 190 to 390 degree Celsius, and an indicator light tells you when it is on and ready to go. A refractory stone hot plate further adds to the authentic taste of the end result, promising the same feel as traditional wood fuelled clay ovens. Thanks to the high cooking heat, it works a lot quicker than other similar models. Fresh pizzas can be ready in just five minutes, and if you select a lower temperature, frozen pizzas can also be prepared. It only takes around 10 minutes to reach the highest setting too, so it is even quicker than ordering a takeaway. Two wooden paddles are included, so it is easier to add and remove your pizza from the oven, but it can also be used with metal peels if you prefer to purchase them at a later date. It is only recommended that you make thin crust pizzas in this oven; the dough rises a lot, and deep pan or stuffed crust would result in it touching the lid. The stone gets darker over time with use, but this only adds to the authentic flavour. As a bonus, it can also be used for other creations such as naan bread, kebabs and garlic bread, just like a traditional model. So, if you want pizzeria-style results without leaving the house, and don’t want to have to rely on the rare nice weather, this maker gives you maximum results for minimum effort.